What if 63 new people – all who are in your target market – expressed interest in working out at your fitness studio? How would that potentially change your membership base? Now … imagine that those 63 new people all requested to workout at your studio within just 24 hours. How would that change the game? That’s exactly what happened for a yoga studio in our fitness marketing program. And we’re going to show you exactly how it was done. Those first 63 leads that came in within 24 hours set the studio up for a really successful campaign. First, let’s break down what we count as a “lead.” This is someone who fills out their first name, last name, email, and phone number requesting to workout at their studio. All fields must be complete in order to be considered a lead. Then, within the first 36 hours, those 63 leads turned into 99 leads. In 1 month, they then generated 475 leads. Their cost per click (CPC) that first month was $00.86. So whenever someone clicked on their Facebook ad (we’ll get to that soon), it cost them less than $1. They invested a total of $408 on Facebook ad spent for that month. It works. Now let’s get to the advertising side of things. By putting the first sentence in all caps and with stars that read ★ATTENTION LADIES IN [CITY]★, it captures the attention of that target audience – women who live in that yoga studio’s neighborhood. We also added urgency in the copy of the ad by stating that the passes are on a “first come, first-serve basis” and to “hurry while they last.” This encourages people to click right away. We’ve also learned that video ads tend to perform much better than images. Facebook videos have a 135% broader reach than other types of content and are seen 12% longer when you add captions. So this Facebook ad in particular included a video of the yoga studio’s interiors, a live class in action, etc. 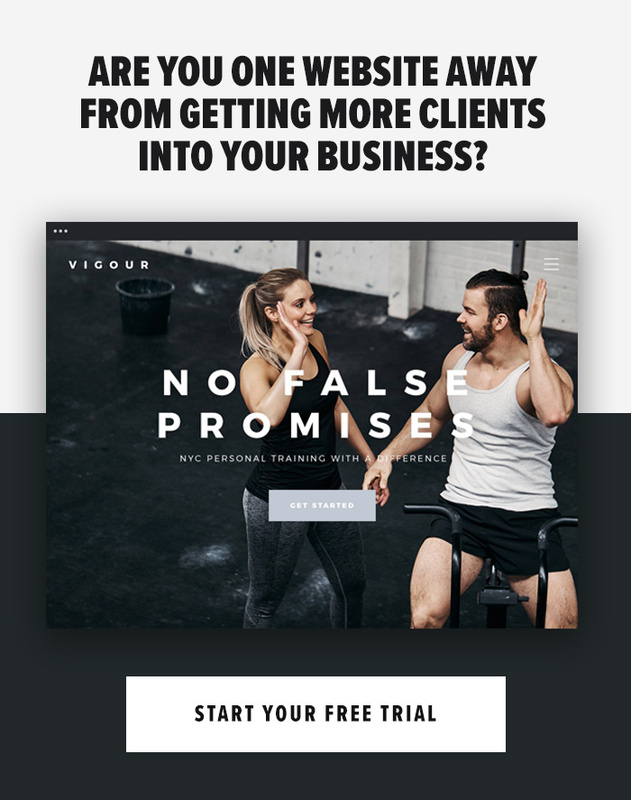 We built this landing page through LeadPages. It included the video again, case studies from the yoga studio’s members, details about the studio (address, hours, description of yoga classes offered), and more. The main thing we wanted people to do when they landed on this page was redeem the free week. That’s why we place the CTA (call to action) button in bright green. It’s the first thing people see. Then to redeem that free week, people had to fill out their first name, last name, email, and phone number. Each one of these filled needed to be completed in order for it to go through. Once it goes through … it’s considered a lead. And that’s how this fitness business got 63 leads in that first day. Once someone opts in to the free week, we wanted our customer to have to do as little work as possible. So we set up several automated processes to encourage that new lead to come into their studio for their first class. The thank you page that people were automatically taken to after they opted in gave an additional bonus offer if people called the yoga studio NOW. We included the studio’s phone number in big green letters on the page as well as a bright button that said “Call Now” and once clicked, started the call. This really encouraged people to take action and secure their first yoga class right away, which made things easier for our customer. This bonus offer was exclusive to people who chose to call. Through our CRM (Infusionsoft), we built an automated email drip campaign that triggered as soon as someone redeemed their 1 free week. That confirmation email also noted the bonus offer that they’d get if they called the studio right then and there. So again, it served to encourage these leads to take action right away. The confirmation email also verified that the studio had received their request, gave information about the yoga classes, introduced the owner to them, and more. What’s great about this drip campaign was that it also sent an additional email a few days later if the lead didn’t come into the studio. This email reminded them to secure their spot right away. Same thing happened 1 week later if they still hadn’t scheduled their first yoga class yet. In addition to the thank you page and email drip, we also built out automated text messaging for the yoga studio. So whenever someone redeemed the 1 free week, an automatic text got sent from the yoga studio owner to the lead confirming that the request went through. It also asked when they wanted to come in for their first class. This way, no matter how late or early it was when someone requested the offer, it ensured that the lead was contacted ASAP. Let us know which of these strategies work best for your fitness business! Mike Arce is the Founder and CEO of Loud Rumor, an online marketing agency that helps local businesses grow and get more customers. Through our proven program, Fit FLAVER, Mike has been able to combine his passion for both the fitness industry and marketing. Using Facebook advertising, landing pages, video, and more, he and his team generate 100 – 200 unique leads per studio each month.